This thing looks much better in real life than in doctored-up press photos. Today the Apple stork came by and dropped the latest litter of high-powered iPhones, among them a $1,000 iPhone X. An army of watchful and upgraded cameras are included in its long list of outlandish and futuristic features, but no amount of technology will ever replace seeing a beautiful thing in real life, be it a sunset, the Grand Canyon, or a concept car colored to look like either of the former two natural phenomenons. We learned that quickly after visiting the BMW booth at the Frankfurt Motor Show where the brand-new Z4 Concept was on display. Suffice it to say, those press images BMW sent out did little to prime the audience for the concoction of sheetmetal and rubber glimmering under the show lights. We did our best to capture a few alluring angles complete with the imperfections of an untouched image so that it lends a better idea of what this carefully-crafted work of art will actually look like to the human eye when seen in real life. Complete with no roof, red paddle shifters, a color-matched interior, and exterior lines that fall into place as the perfect evolutionary step between the previous Z4 and the ultra-modern i8, the Z4 Concept looks pretty enough to convince a few Mercedes-AMG GT C owners to ask for a refund. Unfortunately, these looks will not be backed up with AMG GT C levels of performance like the M8 will. Under the hood remains a turbocharged 2.0-liter inline-four pushing 180 horsepower and 200 lb-ft of torque to the rear wheels. If that sounds like it's too much of a tease given the exterior looks that advertise more aggressive helpings of horsepower, a mid-range offering can bump that same lump up to 248 horsepower and 258 lb-ft of torque while the Z4 M40i will replace the four-banger with a 3.0-liter turbocharged inline-six that makes 320 horsepower and 340 lb-ft of torque. 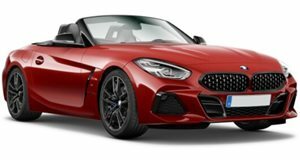 Unless BMW goes nuts with a Z4 M (or M Sport), then the roadster will remain an upscale sporty alternative without being a true and hardened performance car. A six-speed manual will ensure thrill-seekers can look past the nagging feeling that the Z4 is down on power as long as they forgo the 8-speed ZF automatic. By the time production specs are announced, expect a plug-in hybrid variant to have snuck into the mix. We’re not complaining, at least as long as BMW keeps the production version looking as close to this as possible.